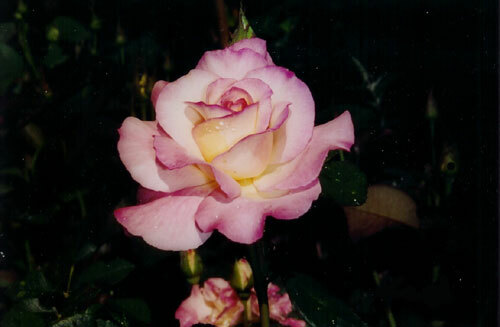 This exhibition quality pink blend Hybrid Tea is a winner of the All-America Rose Selections Award in 1994, Portland Best Rose in 1998 and the Gamble Fragrance Award in 2003. It is white with raspberry pink edges and is both excellent on the show table and garden display. It is a medium, moderately thorny, bushy plant with an upright habit, semi-glossy dark green leaves on long stems and produces lots of large high-centered blooms 4 to 6 inches across. It grows 3 to 5 ft tall and 2 to 3 ft across. Blooms come on single stem or in clusters of three or four. Blooms are double (30 to 40 petals) and tend to get larger in cool weather. Secret is a generous performer giving blooms from late spring to early summer and repeats through to fall. It can be used in beds and borders and if you need lots of fragrant blooms to share with others, plant Secret in the cutting garden in threes so the plants look bushier. It has a strong, spicy fragrance. It is winter hardy and has good disease resistance. Who says modern hybrid tea does not have any fragrance? Secret can perfume a room with just one bloom. WHY DO WE GROW ROSES? 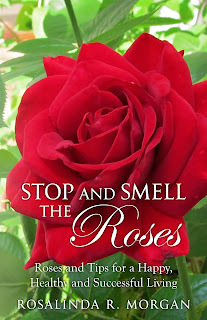 YES YOU CAN grow beautiful roses!